Sweetheart is a theme for all you sweethearts, without being overly sweet. A single column displays your content front and center, but worry not, there is a sidebar — you just need to create the page for it (there is a special ’sidebar-page’ template included). 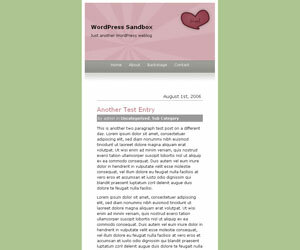 Sweetheart is WordPress widget friendly, which means you can manage your sidebar from your WordPress admin panel. If the plugin isn’t installed or enabled, the theme will use the default sidebar. Of course, if you don’t creat the sidebar page, this becomes moot. Sweetheart has been tested in the most recent (stable) version of IE, Firefox, and Netscape and the (X)HTML/CSS has been W3C validated. Please be sure to read the theme use before downloading and using this theme. If you spot any bugs or have suggestions for improvement, feel free to leave a comment.